Chef George Mendes of Aldea fame, the Michelin-starred Portuguese restaurant in New York City, recently opened Lupulo -- the name translates to "hops" in Portuguese -- a restaurant distinctly different in terms of its design and menu concept. While Aldea is fine dining and more traditional cuisine of Mendes' homeland, Lupulo has a contemporary decor with traditional touches, and the same can be said for the cuisine. An immense oval bar sits smack in the middle of this expansive space that's suffused with natural light. Portuguese blue and white tiles line one wall while heavy maritime-type ropes act as vertical room dividers. An open, non chaotic kitchen takes up one entire wall. This gastropub specializes in dishes that are an homage to Portuguese, but with a welcome creative twist. A mackerel spread had none of the expected bold fishy flavor. Instead, the kaffir lime, Vinho Verde wine, olive oil and a touch of sea salt lend a complex but mild flavor. 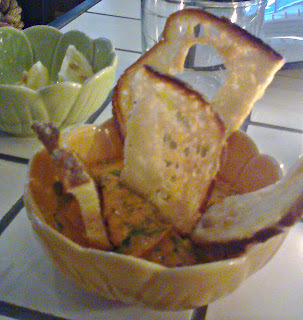 The bowl of mackerel spread is ringed by ultra thin pieces of toast. 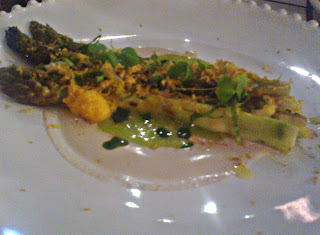 This dish is one of several tasty petiscos (Portuguese tapas or small dishes) that include the light and flavorful grilled green asparagus with a dollop of dried sea urchin, plus sorrel and walnuts. 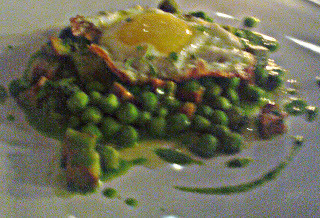 For main courses -- though we shared everything -- I recommend the green peas made with diced chorizo, and topped with sunnyside up eggs along with parsley,Vinho Verde and kaffir lime. (The latter two appear in a number of dishes and, I must say that I never tired of the tanginess they gave each dish.). Another creative entree is the red snapper crudo, served in a bowl of coconut milk and kaffir lime broth, made spicy thanks to serrano peppers plus benne seeds. Unlike most people who love Portugal's traditional egg-based desserts, I find them cloyingly sweet. Thankfully, Lupulo's desserts are Portugal made modern. 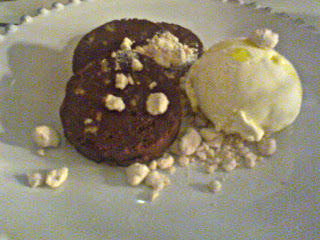 We opted for the chocolate "salami" sprinkled with sweet chocolate powder, and served with a side of olive oil ice cream. Of course, because Lupulo is named for the Portuguese word for "hops," it's no wonder that you'll find a wealth of craft beers, including the Sagres Pilsner and varieties from Japan, Belgium and Germany. Lupulo's wine menu features only wines from Portugal including the region I'm most fond of: the Alentejo. Portuguese wine is suberbous... Good to know you apreciate portuguese food.